Recently, the Top 10 Show had their Top 10 Movies in the Snow and I compiled my own list. I put, at #10, Fargo, mainly because I enjoyed the FX TV show so much. When I had first watched the movie, I was not a fan. 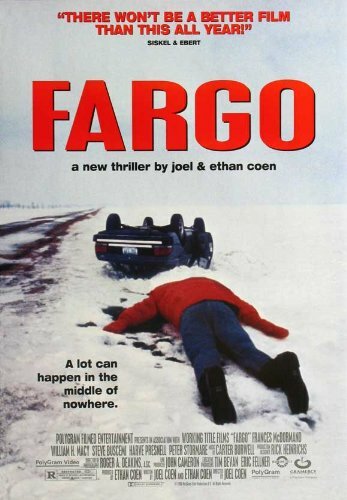 As I wrote the list, I thought to myself that I wish I had watched Fargo for my recent Binge involving second chances. Them fate stepped in as, once again, the weather caused our school to be cancelled. This gave me the opportunity to pull up Fargo on HBO for a second chance. And I am not sure what I was watching the first time, because I LOVED this. The Coen Brothers wrote and directed this story of a man who hired two criminals to kidnap his wife so he could extort money from his wealthy father-in-law. And then all things went to hell. I LOVE Marge! Frances McDormand is iconic as the tenacious pregnant police chief investigating the triple homicide that lead her to the Twin Cities. I laughed every time Marge said anything. Just love this character. William H. Macy is Jerry Lundegaard, who was the auto dealer who hired the criminals, played by Steve Buscemi and Peter Stormare, to kidnap his wife. Jerry is one of the worst characters in this movie because he was such a false person. Everyone else in this movie is exactly what they look to be. Macy is great as the weaselly little grub. Fargo is extremely funny and unbelievably dark. You see a man shoving someone into a wood chipper. I remember that scene when I first saw it and I was not a fan. I do not know why because this time was so epic that I was laughing and loving the scene. Maybe it just appealed to me more now than it did when I was younger, I don’t know, but I just loved this moment. I also thought some of the scenes that were included that had nothing to do with anything were awesome. Why did Marge meet for lunch with Mike (Steve Park)? It had zero to do with the story. It was just like an aside for the film to highlight these wonderful characters living in this oddball area. Truly glad that I watched this one again. It was at #10 on the Movies in the Snow list, but it would be WAY higher if I redid the list today.